When I'm shopping at the grocery store, I always make sure to stop and a take a careful look at the foods being marketed towards kids. These foods are often quite healthy ingredient wise, and they also tend to be more reasonable from a portion size standpoint (although not always of course). They are also really fun to look at (kids get to eat such neat food nowadays)! I recently found these nifty pouches of organic fruit puree made by a company called Revolution Foods at my local Whole Foods. Each pouch contains a squeezable serving (called a "mashup") of blended fruit, that has the consistency, in my opinion, of apple sauce. What's fun about these pouches is that you can put them in the freezer, and easily create all-natural pure fruit popsicles! 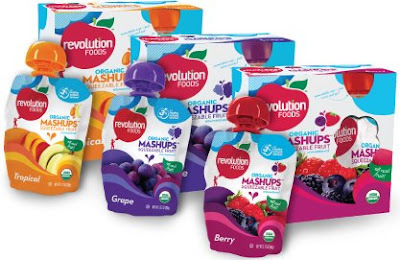 These fruit puree "mashups" come in three different flavors: Grape, Berry, and Tropical. The ingredients are very straight-forward, all organic fruit puree (nothing else) and in the case of grape, some grape concentrate. Thus none of the pouches have any fat in them, or artificial sweeteners or added sugar. The grape and tropical flavors are 60 calories each, and the berry flavor is 40 calories. Each pouch (90 grams!) is one very sweet and satisfying weight watchers point. PS. Here are some other delicious foods targeted at kids that I've blogged about: Snikiddy grilled cheese puffs, Ian's low calorie cookie buttons, and Nana's banana puffets. I love the idea of putting them in the freezer! Wow tow great tips in one post. Good idea about checking out the kid-sized products and I'm loving the idea of putting these mash-ups in the freezer! So much better than those chemical-laden popsicles. Truly great idea. Thanks, Juliet! Trader Joe's has something very similar, in apple and apple-carrot. I like the apple carrot because a hidden veggie is always welcome! where can you buy these yummy diet foods??? You can buy them at Whole Foods! I had these in Paris when I was there last summer. I'm so excited to see them here! These are also at toys r us.....the kids LOVE them and they are ultra-portable!